For the past couple of weeks my 2nd graders have been learning about data management. 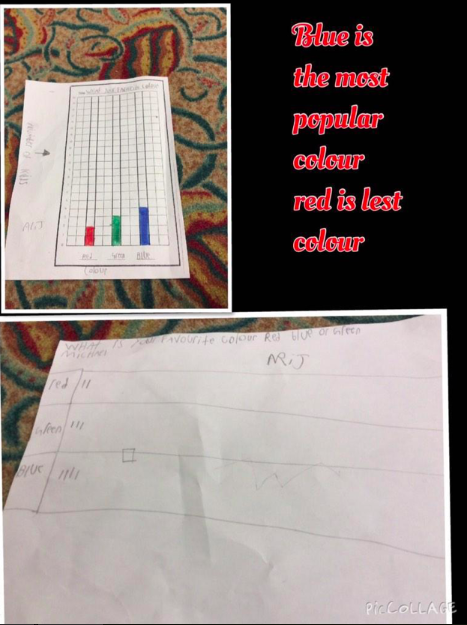 This past week they have learned about collecting data through surveys, how to create bar graphs and how to analyze the data they have received. For their culminating activity I asked them to create a question about "favorites." 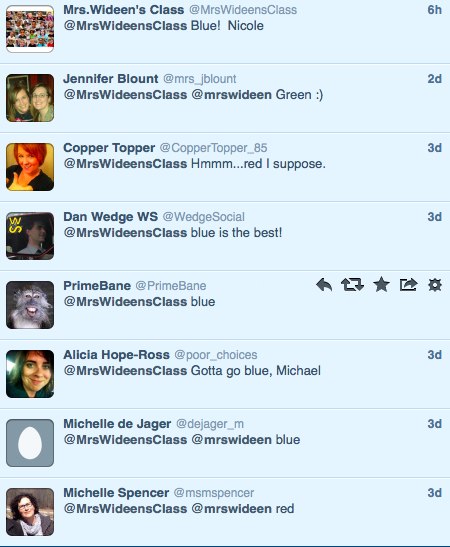 Once they had their question, I had them tweet it out on our classroom Twitter account (@mrswideensclass). I then retweeted the questions on my professional Twitter account to try to get enough responses for them to collect their data. After two days, we had about 10 questions that had a sufficient amount of responses. The next step was for the children to find their questions on twitter and tally the results. After the student tallied the responses they created a bar graph to show the data. I then had the students take pictures of their work and had them use Pic Collage to show their work. We did this because we try to respond to everyone that has responded to our class on Twitter. My class wanted to share their results with the people that answered their survey. After my students created an image in Pic Collage they saved it to the camera roll and responded to everyone that took their survey with the picture of the results and a quick message. First, I want to thank our PLN for responding to the questions. The children were so excited to see all of the results. What a fantastic and different way to collect surveys that are real and authentic. It is also a fantastic piece of assessment that my students enjoyed, were engaged and eager to complete.